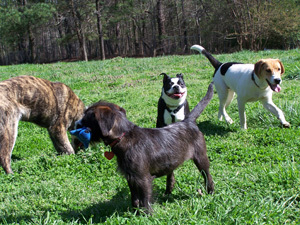 Pet Sitting, dog walking, and other dog care services for the Raleigh, North Carolina Area. - Happy Dog Fun. Happy Dog Fun! Interim HQ's is a delightful environment for any dog. 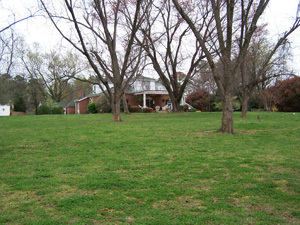 It has a very large, completely fenced area creating a quiet and serene park-like setting where dogs run at full stride and top speed amongst a grove of mature, shade-producing Pecan trees. Or meander and explore at their own speed, soaking up all the interesting smells as they go. The multitude of squirrels in top physical and mental condition provide any squirrel enthusiast canine a run for their money! 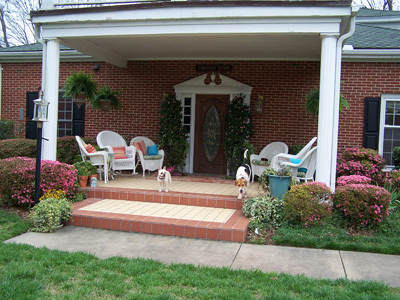 The picturesque grounds are maintained by a staff of highly dedicated and trained individuals. For those pups who like to roll in the grass (and who doesn't after all), it is thick and lush. With special assistance from the Poop Fairy [photo of Isabelle in fairy costume holding poop scooper] the chance of accidently rolling or stepping in something odiferous or squishy is greatly reduced. 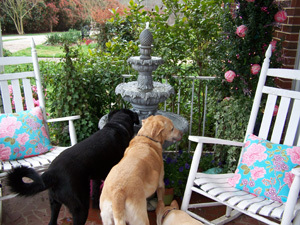 Colorful flower gardens and flowing fountains surround the homestead. Water buckets and kiddie pools are interspersed throughout, providing ample opportunities for drinking and cooling. Your dog will stay in a quaint old farmhouse that features more high quality dog beds per square inch than furniture designed for people. Buckets of toys are easily accessible for times when that playful urge hits. Dogs can curl up in front of the cozy gas fireplace to keep the chill night air at bay and warm those old arthritic joints. Each morning the dogs are awakened to the songs and chirping of the colorful rescue birds living inside and the local wild birds living outside. Meals are prepared fresh and served on site daily. Community or individual dinning facilities available. Food is served inside in the kitchen and sunrooms, or during nice weather on the outside patio. Crate dinning is available upon request. 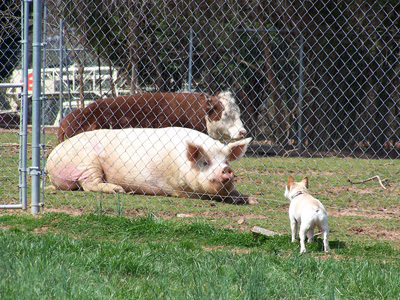 Rescued Farm Animals are housed on site. Many dogs are curious of the strange looking creatures they have not encountered before. 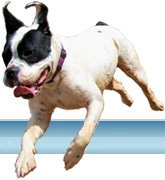 For the safety of all, dogs are encouraged to look and sniff through the fence, but not Touch! Dogs run free enjoying the fresh air and sunshine when not otherwise engaged in an organized activity such as fetching, biking, or soccer games. There are plenty of off-the-ground dog cots for a mid-morning nap or afternoon siesta. For our sun-worshippers there is a multitude of cozy spots to sprawl out and soak up the sun's warm rays. If this sounds like a place you would like your dog to visit or stay at, then please give Happy Dog Fun! a call.